Mitsuboshi Beer Vienna is another beer from the three star brand by Morita Kinshachi Brewery. It is an amber beer crossed with a Vienna style beer from the 19th century. Mitsuboshi Beer Vienna is a 6% beer, so a little on the strong side compared to their other beers. Oh this means nothing to me!! OH VIENNNNNA!! Ahem, sorrry. Mitsuboshi Beer Vienna had a light golden-amber colour with a slight foamy head to it that didn’t hang around for very long. My wife thought I was mad for sniffing it for so long but it had a malty aroma to it that was paired with caramel notes. The beer itself was a tad bitter for a lager. It had a faint aroma of roasted malts and I was unsure if I liked it or not. Apparently, Vienna lagers are popular in Mexico, but then so is Sol too, which doesn’t really say much. It was a bit of a drag to drink and the bitter roughness wasn’t too my liking. The aftertaste wasn’t much better and left my mouth feeling empty. 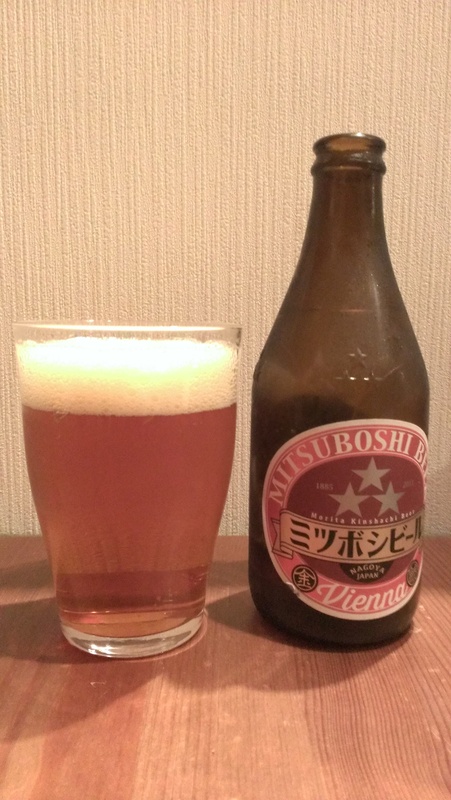 I wasn’t impressed with Mitsuboshi Beer Vienna at all and really can’t recommend it, unless it’s cheap. Like 50% off. Or more. Mitsuboshi Beer Vienna can bought from the Kinshachi Online store here as part of a set or at these retail stores across Japan, listed here. I like the Vienna more than the other Mitsuboshi styles. It is a bit expensive, mostly around 550 yen a bottle. But I think it is a nice style, being malty but not too sweet.